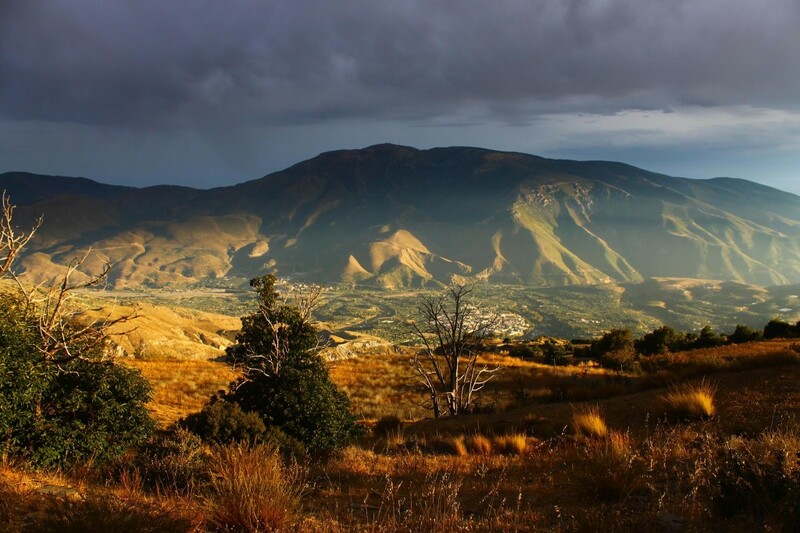 La Alpujarra*, which extends beyond Granada Province into Almería, is a hugely popular year-round holiday destination. Set amongst these beautiful southern foothills of the Sierra Nevada you will find pretty whitewashed villages, dating back over 1000 years, that could have been transplanted straight from the Rif Mountains of Morocco, from where their Berber architectural heritage can be traced. People are attracted, from all over the world, by the impressive geography and outstanding natural beauty of the region which boasts exceptional bio-diversty. Arguably these virtually unspoiled slopes are at their most stunning in the springtime, when the wild flowers are rioting all over the hillsides and you can enjoy the peace and beauty of the mountains before the heat arrives, or in October, when the days are bright, but the sun less ferocious, and the trees are ablaze with autumn colours. However, every season has it attraction in this fascinating region and you can explore by bus, car, cycle, on foot or even on horseback. There are buses that go up into the hills, but a better way to get a feel for the area as a whole is by car. 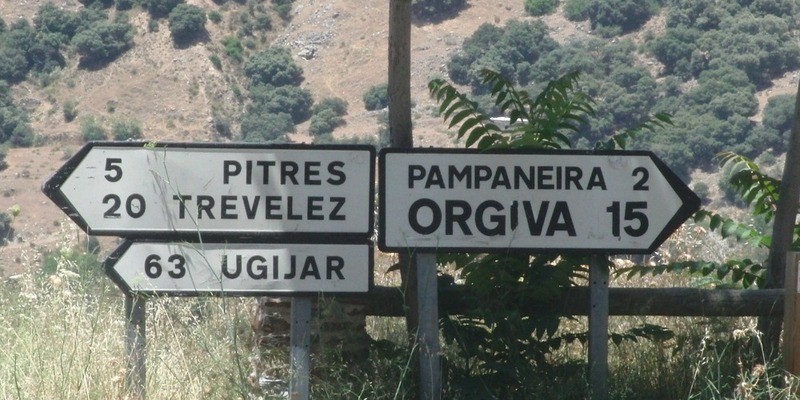 From Órgiva you can take the GR-421 up into La Alpujarra. See the map below. If you are based in the city and don’t have a car there are guided tours that you can take which will give you a good feel for this wonderful area. Click here for more information on an Alpujarras day tour. Lanjarón, gateway to La Alpujarra, is famous for it’s spring water (now owned by Danone and sold all over Spain), thermal baths and local crafts. There you can also visit the honey museum and the Water museum, designed by Juan Donimgo Santos, which showcases the historical relationship between water and architecture in the region dating back to the Moors. It is also a great base for many mountain activities such as riding and hiking. The busy market town of Órgiva, which is 30 minutes from the motorway (Autovía de Sierra Nevada A-44) is the regional capital. It is known for the hippy community of Beneficio and also made famous by Chris Stewart in Driving Over Lemons, his gentle, ambling tale about moving to La Alpujarra. For anyone holidaying in the area, Órgiva makes a great base from which to explore the mountains or make trips to the city or the sea. As you work your way around the mountainside, you reach the famous trio in the Poqueira Barranco: Pampaneira, Bubion and Capileira. These three village are incredibly picturesque, if somewhat unreal, and a mecca for tourists in search of refreshment, souvenirs and the traditional Alpujarran jarapas rugs. You may struggle to haggle over these particular items, as the numerous shops selling these brightly coloured hairy rugs stick to a standard price and do not undercut each other or offer discounts. If you are in the car you might want to pay a visit to the petrol station just beyond the Bubión turn off as you head eastwards and deeper into the hills. Opportunities to tank-up are few and far between. Further on are the villages, or hamlets, of La Tahá, the ‘capital’ of which is Pitres, which has a great place to camp at Balcón de Pitres (nice pool and restaurant) and places to eat including El Mirador de Taha which offers an excellent, healthy menu with some great vegetarian options. There are are some lovely walks in this area between the villages of Mecina, Mecinilla, Fondales and Ferreirola. Mecina Fondales is also the source of naturally carbonated spring water. A few more kilometers on and you reach Trevélez (highest of the high villages in La Alpujarra, if not the whole of Europe) famous for its snow-cured jamón serrano. You might also want to try local trout at the restaurant at Camping Trevélez which you will find on left as you drive into town. 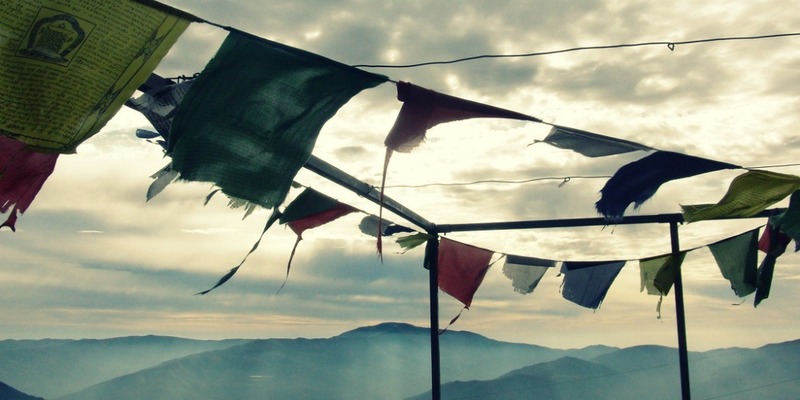 The Buddhist retreat of O Sel Ling is truly one of the most beautiful, peaceful spots in the area. The name, which was given to the centre in 1982 by the Dalai Lama, means Place of Clear Light. From 1600m, as you look out towards Sierra Lújar and the Rif Moutains of Morocco in the distance, it feels like being in the gods. Visitors are welcome from 15.00-18.00. If you follow the road between Soportújar and Pampaneira (going East), take the left hand track opposite La Ermita del Padre Eterno (white chapel right on the bend in the road). Keep going up the dust track and take the sharp right hand turn after the stables on the left. There are a couple of sign posts on the way. Keep going until you reach the car park below the prayer wheel at Os Sel Ling. That is as far as you can go in the car. La Fuente Agria, near Pórtugos, is a natural spring rich in iron and known for its medicinal properties. There is a stopping place and recreation area on the right (as you drive East towards Trevélez) opposite La Ermita de la Virgen de las Angustias. You can also take the steps down from the picnic area to Fuente Chorrerón, a waterfall leading from La Fuente Agria, where you will find the most surprisingly refreshing spot to take a moment on a hot day. Take care when taking kids, in the unlikely event that they should be dressed head to toe in white, as the water leaves a red deposit that will stain clothes. They will delight in the place which is as close to a fairy grotto as you will find anywhere. There is a market on everyday of the week somewhere in La Alpujarra. Whether you are the type to go in search of markets, looking for a bargain and to check out the local produce, or you prefer to avoid the hassle and bustle altogether it can be very useful to know when and where they are.